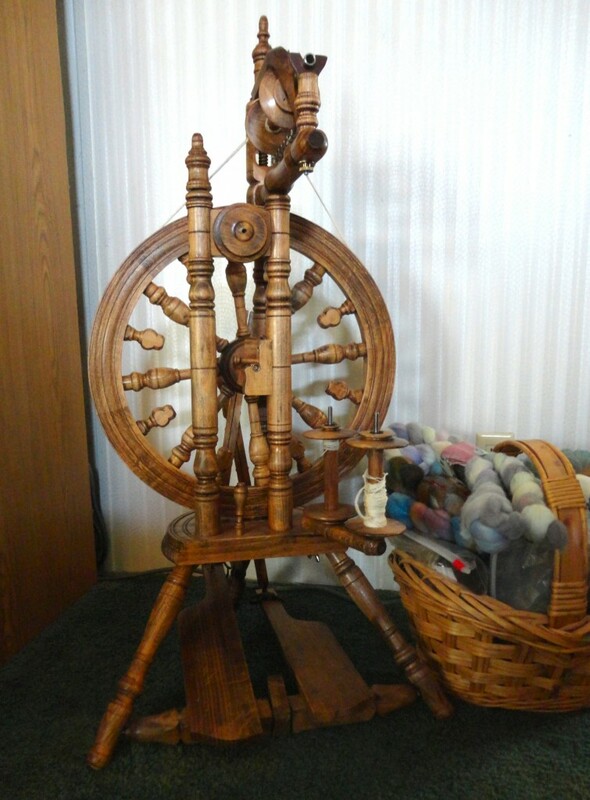 I decided a while back that every 35 years or so, a person deserves a new spinning wheel… so when a bit of a windfall came along, I took the leap! My criteria: I love a traditional look, it couldn’t be too big, and it needed to offer something besides what I already had in my old faithful Country Craftsman. And last but not least, it had to be within my price range. At the top of the short list: Kromski Minstrel. I have always liked the look of a castle-type wheel, and this one is a double-treadle that can switch between double drive and Scotch tension. 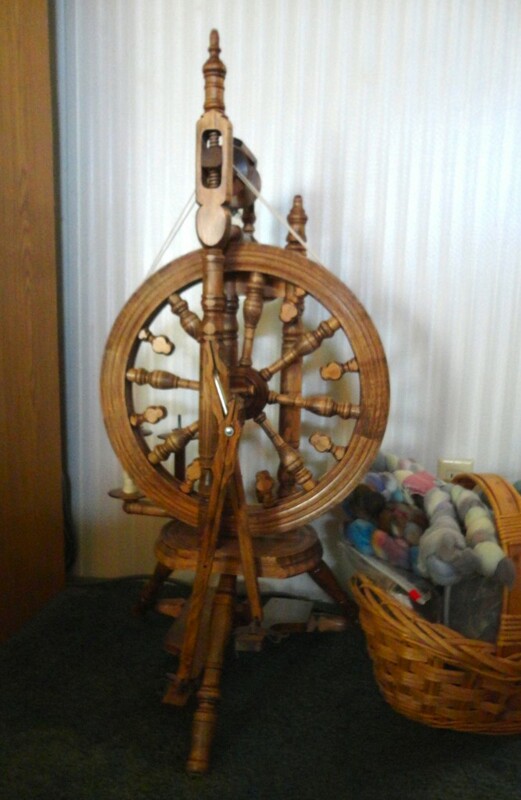 It also has a larger bobbin capacity. Sooo… on the way home from a trip to Kansas City, my hubby and I stopped off in Lawrence, Kansas to visit the Yarn Barn. I took a quick cruise around the wheels on display, and went for a test-drive on their floor model Minstrel. It probably took me less than 2 minutes to decide that it was the wheel for me! (The store employee looked a little surprised that I made up my mind so quickly.) They had an unfinished one in stock, and I said I’d take it. When they told me that they offered a 20% discount on all fiber purchased at the same time, my real dilemma began. Silly, isn’t it, that it took so much longer to choose a few ounces of fiber than a whole spinning wheel! I didn’t want need more fiber, so I settled for 4 ounces of Mountain Colors hand-dyed Targhee wool in a color that was something besides deep blue-green. You gotta break out a little bit! I am proud to say that I behaved like a responsible adult with my new wheel. I did unbox it and drool over the parts as soon as we got home, but I knew that if I put it together right away, I would probably never take it apart again to finish it. So I dusted off my self-restraint, and after due consideration and consultation with a master woodworker friend, I settled on an oak finish and purchased the necessary supplies. It took about a week and a half, what with all the various coats and fine gauge steel-wooling, but the self-control paid off. By this time, I was intimately familiar with every little nook and cranny of each piece. I’m only sorry that I didn’t get a ‘before’ picture of all the parts laid out. Anyway, here is my new lovely Minstrel! It spins beautifully, and I could not be happier! The ‘other’ side… see the footmen for the double treadles?